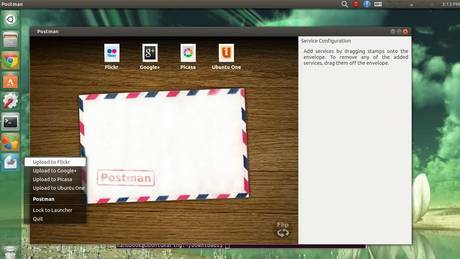 PostMan is a small utility allows to upload images to Flickr, Google+, Picasa, and Ubuntu one. This is done through a simple and modern intuitive user interface. Drag stamps to mark destinations, and drag images to select content. Once installed, open PostMan from the Unity Dash Home. In the main window, drag and drop your services onto the envelope and then login.